I’m happy to announce that an app I worked on earlier this year has finally gone live on the App Store; IslandBreak. 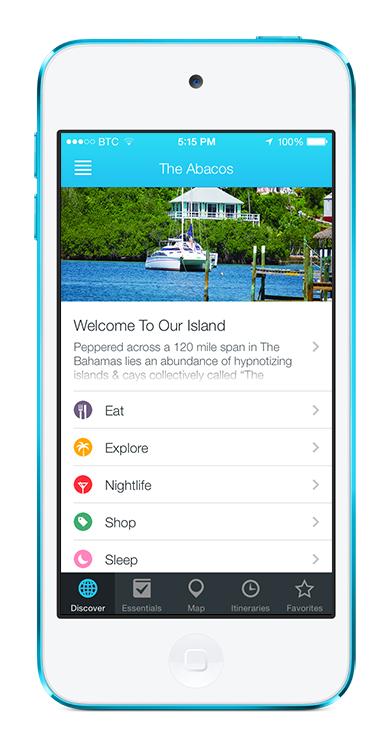 IslandBreak is a smart travel guide for the Bahamas with a complete list of restaurants, bars, historical sites, hotels, beaches, and tours. The app was interesting to work on due to the need for a completely offline experience. This wasn’t limited to just the points of interest and itineraries (which feature a huge amount of beautiful high-resolution photos) but also the map; this was a requirement so that tourists don’t have to use their data plans, particularly in an area which has very poor mobile reception1. Getting a full map of the islands complete with multiple zoom levels and the experience you expect on iOS was difficult, but works really well. In addition, I built an online CMS so that the app content can be updated remotely without going through the App Store approval process.